Sounds Like: For King and Country, Third Day, and Phil Wickham. 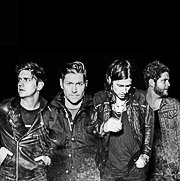 New to the scene this week, is an all American Rock Band, NEEDTOBREATHE. The band was conceived in 1989 when brothers Bear Rinehart (Lead vocals and guitar) and Bo Rinehart (Backing vocals and guitar) began to perform at small music festivals across the south east. They slowly began to amass a loyal fan base, and on the summer of 2006 released their debut album Daylight. Critics around the country quickly took a liking to the authentic wholesome sound that the band promoted, and quickly rose to 20 on the top 200’s charts. The band went on to releases 4 more albums, each exceeding the last. H A R D L O V E, the latest album the band released received outstanding reviews across the country, with songs such as Happiness making it to number 17 on the billboards. The album includes lyrically loaded song that challenge many pre-conceptions about controversial issues we face today. “We considered every note, every sound, and every lyric that went on this album,” says lead singer Bear. The band has a unique way of intriguing melodies with a bright chorus. Each song included on the album H A R D L O V E is certain to translate to everyday individuals, and people are sure to relate to the powerful message behind it.